Short film on the struggle of the workers at DITA in Tuzla. This is the factory which sparked the Bosnian protests taking place at the moment. The film gives a taste of the anger which has spurred Bosnian workers into action. Seething anger at the dire economic situation, political corruption, mass unemployment and poverty has boiled over in Bosnia. In three days of lightening speed struggle by workers and youth the government has been shaken to its foundations. DAY 1 Wednesday, February 5th. Laid off workers from the privatised and now closed chemical works DITA in northern Bosnia and three other firms demonstrated. They accused the government of standing idly by as several state firms collapsed after privatisation. “Elections will change nothing and only actions like this, and I’m afraid, even more radical actions, can force our politicians to step down,” said one protester. Football fans joined the workers, as well as the unemployed. Stones were thrown and tyres set on fire. At least 20 people were injured and over 20 arrests made. Workers continued to demonstrate in Tuzla. A ferocious battle took place as 130 people, including 104 police officers, were injured. Teargas was used as thousands tried to storm government buildings in the town. But Tuzla was only the spark which ignited protests in the whole of Bosnia. Solidarity protests were held in the capital Sarajevo and the towns of Zenica, Bihac and Mostar. Prime Minister Nermin Niksic held a security meeting and inevitably blamed hooligans for the unrest. In reality it was workers who led the way The protesters were initially made up mainly of workers laid off when state-owned companies that were sold off collapsed under private ownership. Later thousands of jobless people and youths joined in. Bosnia has an unemployment rate of 44 percent and one in five people are living below the poverty line. Even those in work are getting by on €250 – €450 a month. Many workers in DITA had not been paid for over two years! “It was our government that sold state assets for peanuts and left the people without pensions, jobs or health insurance,” said 24-year-old Hana Obradovic, an unemployed graduate from Sarajevo. The government ordered schools to close on Friday. By Friday protests had spread to over 30 cities in Bosnia and with it the anger at the corrupt politicians. Demonstrators set fire to government buildings in Sarajevo. 145 people were injured in the capital, including 93 policemen. Police used rubber bullets and tear gas to disperse protesters as demonstrators stormed a presidential office, which was set on fire. Sakib Kopic, one of the workers’ representatives, said they were “the people’s answer” to the government’s failure to address the ongoing economic decline. “This is the shout of rage, hunger and hopelessness about the future that has accumulated for years since the conflict and is exploding right now,” local newspaper Dnevni Avaz said in an editorial. Several thousand protesters in Mostar stormed two local government buildings and also set fire to the city hall. Police did not intervene. On Friday people finally burnt down government buildings in Tuzla. Eyewitnesses have told us that the Special riot police took off their helmets and protective clothing and let the demonstrators get on with what they had come to do. Later the police were applauded and handshakes were exchanged with demonstrators. “I think this is a genuine Bosnian spring. We have nothing to lose. There will be more and more of us in the streets, there are around 550,000 unemployed people in Bosnia,” said Almir Arnaut, an unemployed economist and activist from Tuzla. In Zenica and Tuzla the politicians in charge of privatisations were forced to resign by the protesters. Why now? And where now? Bosnian workers have endured 20 years of misery since the civil war. 20 years of mass unemployment. Power sharing quotas along ethic lines has enabled corrupt politicians to enrich themselves in the poorest country in Europe. Workers have been reluctant to struggle for fear of provoking ethnic tensions again. But there is a limit. The privatisations and closures have been the last straw. There is a yearning for working class unity in Bosnia and even nostalgia for the times of Tito which is reflected in the placards on demonstrations and postings on Facebook. One placard read: ‘ARISE TITO! SEE WHAT YOUR PIONEERS ARE DOING!’ The ‘Pioniri’ (Pioneers) were the Young Communists in the time of Tito and the Socialist Federal Republic of Yugoslavia which was dismantled during the Bosnia Civil War in 1992. The centrally planned economy in Yugoslavia during the post war period developed industrial areas such as Tuzla where the recent protests began and there was a general raising of living standards, guaranteed jobs and housing. Although Tito clashed with Stalin and placed Yugoslavia outside the Soviet bloc the system was nonetheless based on Moscow’s bureaucratic undemocratic version of socialism. It is however understandable that there is a certain nostalgia for Tito even amongst the youth. Parents tell their kids of the times when everyone had a job, a home and a future to look forward to. Capitalism was born in Bosnia through a horrific ethnic civil war and has offered nothing to the Bosnian working class except poverty, corrupt politicians and the threat of further ethnic conflicts. 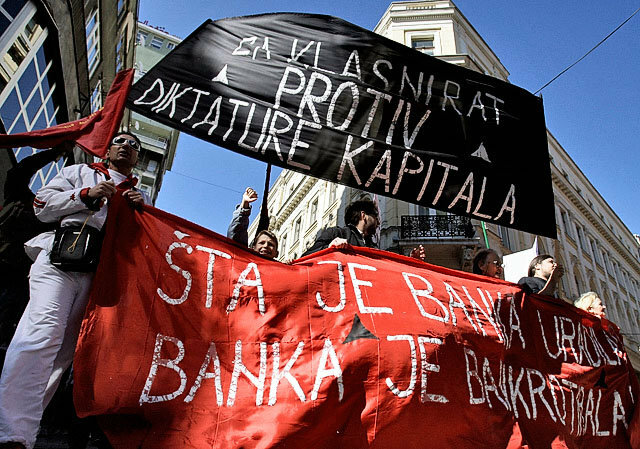 Today socialists stand with Bosnian workers who have risen to kick out the corrupt politicians and urge them to renationalise companies like DITA, take over the banks and plan the economy in the interests of the working class but with the added guarantee of full worker’s democracy at all levels of society. These are early days in the Bosnian uprising but already the workers and youth are striving for unity. They are united in their utter contempt and hatred for the corrupt government and their hangers on. No political party represents the working class in Bosnia at this time. It is significant that in Banja Luka, the capital of Bosnia’s Serb half, some 300 activists and citizens staged a peaceful march to call for unity among all Bosnia’s national groups. Workers and socialists around the world salute the Bosnian workers and youth in their struggle against privatisation and corruption and for a better life. In the coming weeks and months Bosnian workers will be dealing with the questions of class unity amongst all ethnic groups and what kind of society is needed to provide full employment and how to end the nightmare of poverty and misery which capitalism has forced upon them. SOLIDARNOST I REVOLUJICA! Today protesters in Sarajevo gave the Prime Minister of the FB&H Nermin Nikšić until 19’00 to resign. He did not.